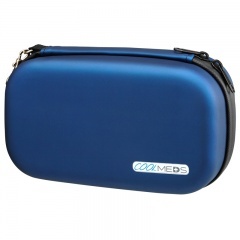 The All-In range is a series of specially designed diabetic kit cases that are practically configured to organise your kit nicely and neatly. The slim size makes them convenient for transporting in handbags, school bags or briefcases during everyday life. The cases come in 4 vibrant, stylish colours (Lime Green, Bright Blue, Rose Gold and Glitzy Silver) that are a welcome change from the usual medical themed cases. These attractive All-In cases are made from firm EVA that provides a tough, protective exterior whilst also being easy to wipe and keep clean.